Last week we took a look at different options for backing up, storing, and sharing data files with online storage services. This week we will take a look at services which are more secure. 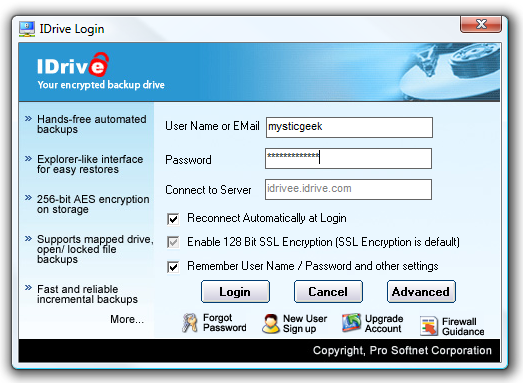 IDrive uses AES 256 bit encryption for its online storage service. Transfers of data to the drive is done with 128 SSL encryption. IDrive allows you to sign up for a free 2GB account. Their Pro Personal Account is 4.95/month for 150GB of storage. They also offer accounts for businesses at different rates. As with other online storage services you need to set up a free account on the site and download the desktop software. When you first launch IDrive you will be prompted to log in. After signing in you will get a window to set up the encryption storage password. I set my own password as recommended. Make sure you do not forget this password as you cannot retrieve it if lost. IDrive does not store the passwords on their servers. 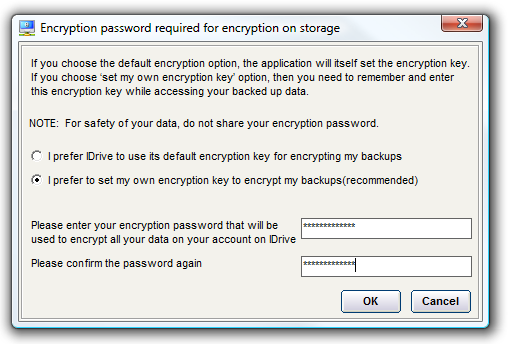 If you choose the default encryption key from IDrive you will never need to enter one in. After setting the encryption password you are given a verification message advising not to share or lose the password. 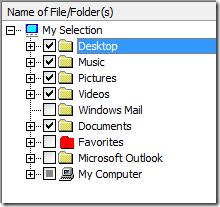 When the IDrive Classic manager launches, notice some directories are pre-selected. This definitely put me over the 2GB limit for the free account right away. No worries, you can change the directories to whatever you need. Ok, I chose a couple of my directories to backup. You can see the total size of the combined files is 212 MB. When everything looks good go ahead and click on Backup Now. A progress screen comes up while IDrive prepares the files for backup. This is the screen during the actual secure data transfer. 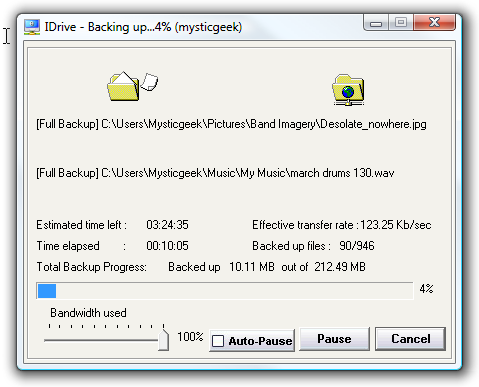 Notice you can adjust the amount of bandwidth used and can pause the backup. When the process is complete you have the option to check out the log file right away. The log is a long text document of every file that was backed up. 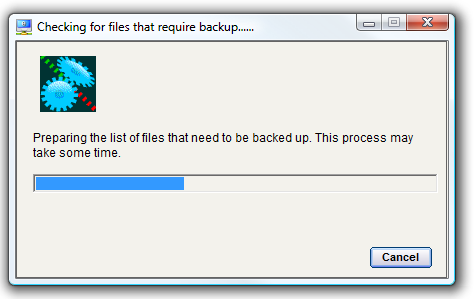 This can get pretty lengthy if you have a lot to backup. The most important part to notice is at the bottom which verifies the start and stop time and that all backups were successful. IDrive creates a virtual type drive on your computer. 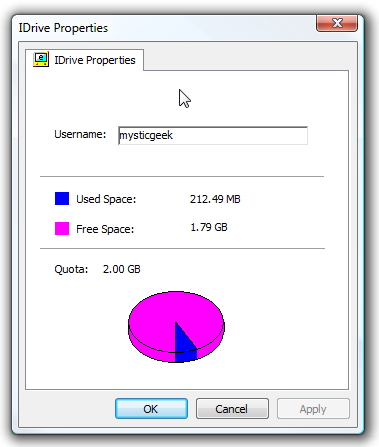 If you go into My Computer you will see it there as a networked drive and you can select properties to see how much space is available without having to open up IDrive Classic or browse to their website. 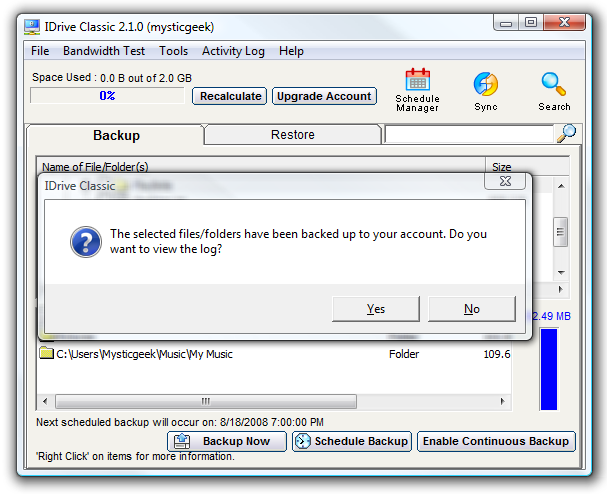 The IDrive Classic application is where to make changes and schedule backups. You can also view previous logs, run bandwidth tests, and sync folders. 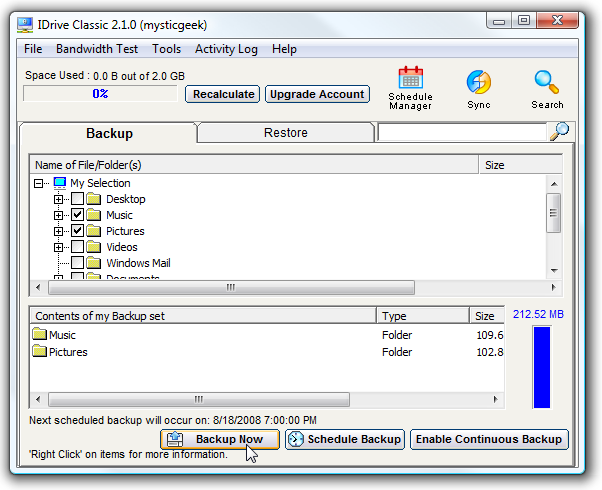 There is also a feature called Continuous Backup which will monitor the backed up directories on your computer and update them on IDrive as needed. 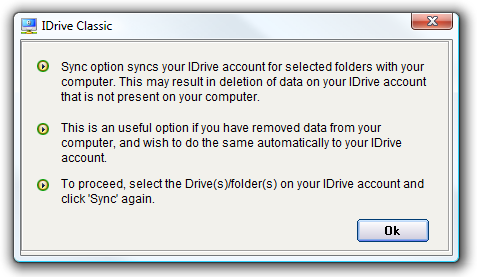 IDrive works with Windows and Mac.